While in Los Angeles for The Muppets press junket, we had the pleasure of sitting down with the production designer, Steve Saklad. The process begins with what are called “mood boards”. The purpose of the mood boards, or collages, are to give them a general idea of what the set should look like. The mood boards are drawn up before they actually have the location chosen for where they will be filming, and before they have finished designs. The sketches and drawings are useful to the director and the crew, who will then have a visualization of where any potential problems are that need to be resolved before the filming begins. In addition to the mood boards, they also used a continuity book, a comprehensive reference book for the shots they’d taken and the end result. 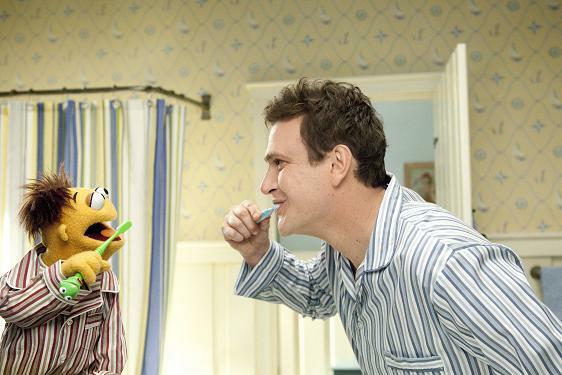 If The Muppets 2 happens, then their research is already complete. Saklad then walked us through the story line for The Muppets. The beginning of the story is set in Smalltown, USA. This is where Gary (Jason Segel), Mary (Amy Adams), and Walter live. He described their world as a part Norman Rockwell and part Small Town, USA. The scenes set in the characters’ hometown were filmed on a back lot at Warner Studios. The movie opens with a grand musical production which lasts about 5 minutes, and follows in the tradition of Broadway and Hollywood musicals. 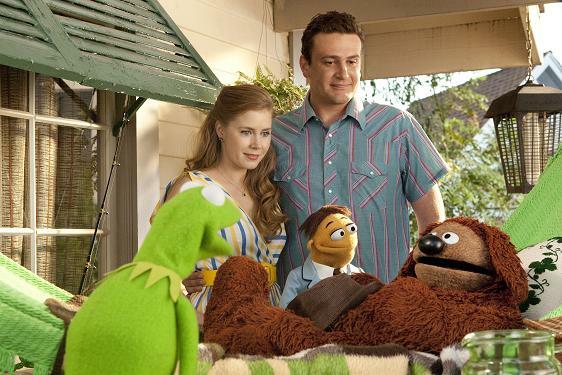 The characters then travel to Hollywood, where their first stop is the Muppets Studio because Walter is such a big fan. The Jim Henson Studio, where this and other interviews were conducted, was originally the Charlie Chaplin studio. Some of that history has been preserved in the remaining architecture. Other scenes in the movie were filmed at the Walt Disney Studios, such as a stunt involving a car crash. In The Muppets, Kermit has his very own mansion. We were fortunate to see a few clips of the film while at the Jim Henson studios, and saw the finished detail of the gate outside of his mansion. The gate features Kermit’s and Piggy’s faces. Saklad shared with us that Hugh Hefner’s mansion was the inspiration for Kermit’s. 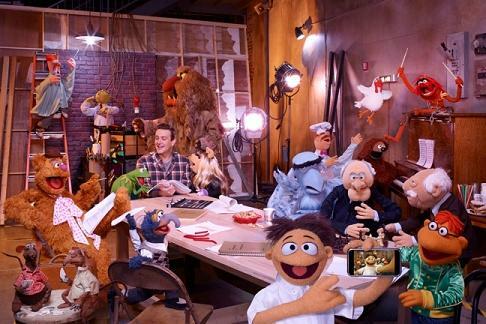 This was Saklad’s very first Muppets movie, and based on the mood boards and footage that we saw, he did an incredible job.